If you’re looking to save money and balance your budget, one of the easiest ways to cut back is on your monthly grocery budget. Meal planning is the easiest way to save money on your grocery budget. And, when done right, you can cut your grocery budget in half—or more. Grocery costs is the most flexible expense on most people’s budget, which is why it can be very easy to save money by just planning ahead. I have to admit that meal planning was one of my biggest challenges. Not that I didn’t know how to save money on groceries. The thing was that I didn’t really know how to put it all together into a plan that would save me a lot of time as well as money. I always used coupons and shopped sales, which is why I had a ton of food that I saved money buying. But what I also had was a fridge, freezer and pantry full of food that I had no plan on when or how to use. As you can imagine, I wasted a lot of money on food after having certain items in my fridge go bad, or freezer burned food in my freezer. Not to mention, having a pantry too full to find anything certainly didn’t help. I would just end up buying those items over and over again because I had no idea that I already had them on hand. Let me tell you something about myself. I hate preparing meals daily, I truly do. It’s my least favorite chore, yet I have to do it day and day out. I mean, my family has to eat, right? It’s not because I hate to cook or make delicious meals. The thing that bugged me the most is that it seemed to take so much time out of my day. Prepping meals, cooking and cleaning the dishes I used to prep and cook. Then, after everything was all said and done, I’t have to start cleaning all over again. Luckily, I finally decided to learn everything that I could about meal planning that totally changed my view about cooking, prepping and planning. I finally learned the RIGHT way to meal plan and it literally cut my grocery budget in half. If saving money on groceries, spending less time preparing meals and cleaning up sounds good to you, then read on to find out how I made it work for me and how you can too. The first thing that I needed to do was to take inventory of everything that I currently had on hand. I took stock of my overloaded pantry, freezer and fridge. From there, I made a plan on how I would use what I already had on hand. There were many meals that I could think of to use most of these items. But i didn’t want my family saying, “this again” all the time. So, I searched online for some recipes that would utilize the items that I had on hand to help me expand my meal planning. I made the items in my fridge a priority to make sure that I didn’t throw out any food that might go bad. While doing this, I saved myself from doing a full-blown grocery run for over a month. I just needed to go and pick up a short list of items every week which was a big boost of encouragement to keep at it. After a few weeks, I was finally able to actually see what we had on hand. This is when I started to organize my pantry, fridge and freezer so that I could easily take inventory of what I had available. I started by emptying out one space at a time—first my pantry—and placing everything on my kitchen table. Were there any items that were expired? I set these aside to throw away. Are there items that I bought that I thought my family would like but ended up hating? Are there items that I had way too much of to use before they expired or taking up way too much space for too long? These items were set aside to donate to a local homeless shelter. Next, I placed bulky items such as flour and sugar bags into airtight containers that not only preserved them better but also saved me a lot of space and were easier to find. I then grouped all similar items together. All boxes of pasta together, small seasoning packets together—I use small tray from the dollar store to keep them organized. I also bought three can rack dispensers to organize all my canned vegetables, fruits and soups. This really helps keep my pantry organized, saves space and helps me easily see what I have. I put taller items in the back of my pantry and smaller and shorter items in front to make everything easy to see. Lastly, I installed some small trays—again from the dollar store—to the inside of my cabinet doors and on the top of the inside walls—where space is usually lost—to place spices and other smaller items. I also used this technique fridge and freezer. I’m sure that you get the picture on how to do this. All you need to do is organize them—and keep them organized—in a way that will make everything easy to see and access. After I decluttered my food storage areas, the next step was planning or purchases. I used to just keep buying some items over and over again because they were items that we often used. Yet, not realizing that I had plenty on hand, because of all the clutter, i had no idea if we needed them or not. With an organized kitchen, creating a shopping list of things that we actually needed became a lot easier. Sale items are the core of my plan now that I have my act together. I will never pay full price again for any food staple that we use regularly. This includes meat, which is the biggest expense in most people’s grocery budget. I plan my meals around what is on sale. I think that when people hear this, they get turned off and may come to the conclusion that they’ll be eating a certain item all week long just because it’s on sale. This is not how I go about it, just because chicken is on sale this week, doesn’t mean that we will be eating chicken every day next week. Grocery stores run sales on items in cycles. The most common cycle is every four or six weeks, depending on the store. Once you know what the sale cycle is for the stores that you shop at, saving money by never paying full price becomes much easier. Now that you know your grocery stores sale cycles, you can better plan when making a shopping list. Let’s say that the sale cycle at your grocery store is every six weeks. You check out the sales flyer and see that they are having a great sale on cold cuts, chicken, canned vegetables and pasta. You then calculate how much of each of these items that you normally use in six weeks so that you know how much you should buy to last you until those items go on sale again. And, since these are staples that you use regularly, they won’t go to waste. It may take up to six weeks to get caught up on maximizing your saving on sales items. But, once you do, you will never pay full price again for groceries that you use all the time. This is where my meal planning takes a twist into not only saving money, but also a lot of time. I am big on the idea that “Time is Money”. The less time that I spend doing everyday tasks, the more time that I have to do other things. After I took all the necessary steps to save as much money as I could, my next goal was to save as much time as I could without giving up on the quality of the meals that I made. Freezer cooking just jumped right out at me as a great way to save time. Learning about the concept of freezer cooking sounded like the perfect solution. Freezer cooking is basically prepping as many meals that are freezer friendly ahead of time. Then, when you’re ready to serve them, you just take them out of the freezer to thaw and place them in the oven or crockpot for quick and nutritious meals. I spend about three hours every other weekend prepping my freezer meals. I normally prepare three dishes and make about six of each meal at a time That is 18 meals for the coming months. Then a few weekends later, I make different dishes in the same quantities. I find it easier to freezer cook this way because I am basically batching my work together to save a lot of time. So, if I am in vegetable chopping mode, I do it for all 18 meals at once, and then move on to another task. This saves me a tone of time on cleaning up, too. Casseroles and crockpot meals are great choices to start freezer cooking. Lastly, after dinner each night, I take any leftovers that there may be and create single servings and freeze them. These are great for lunches later in the week to take to work or school. What’s great about this is that you never waste food that may sit in the fridge or a little too long. It’s also really nice because we’ll have a variety of meals to choose from. We don’t end up having the same thing for lunch as we had the day before. Another benefit of this system is that everyone can choose what they want to bring to school or work. The kids and my husband and I can just choose what we would like to have or lunch the next day and jut throw it into our lunch bags…super easy right! And never any waste! Seasonal items—Purchase vegetables and fruits that are in season to save more money. You an work these into your freezer meals. You can also freeze or can them for later use. Coupons—I do use coupons, but I am by no means an extreme couponer. Instead of buying the Sunday paper, I scan sites like coupons.com, Smart Source and Hopster for coupons on items that are already on my shopping list. Use Apps—I use apps like Ibotta, Checkout 51 and SavingStar to get even more savings on items that I purchase. Shop at drugstores—Drugstores an be a good resource for certain items where you can get great bargains. You can get great deals on items such as cereal, canned soups, coffee, and milk. Grow your own vegetables—Growing some of your own vegetables isn’t as difficult as you may think. I don’t grow a huge garden, I simply started out with just a few containers. One I became more comfortable with gardening, I moved on to a small 4 x 4 foot raised garden bed. You can grow quite a bit of vegetables in a small space and it saves time on maintenance as well. 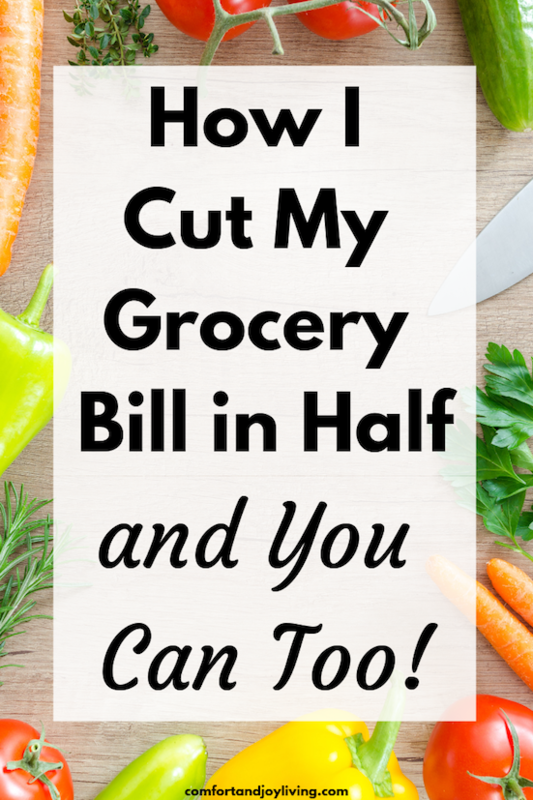 Cutting your grocery budget in half is totally doable. It just takes some planning to gt the most savings as you possibly can. And, before you know it, you will have cut your grocery budget in half and saving yourself hundreds of dollars every single month.